This syllabus will change as the semester unfolds. Print at your own peril. Bring a laptop to class if you have one! If you don’t have one, you will check one out for free at the Lamson Library circulation desk (bring your student ID). In class: we will get to know each other! THIS MATTERS! In class: we will make sure you are a registered IDS major. In class: we will do sign-ups for caring community co-ops, as well as forms for social media photo releases. In class: we will hook you up with a Hypothes.is account. In class: we will help you add a bookmark for our course spreadsheet. In class: we will hook you up on Twitter (our program hashtag is #PlymouthIDS; our class hashtag is #IDSintro; our program handle is @PlymouthIDS; my Twitter handle is @actualham). Using Tweedeck is recommended! Twitter is NOT required if you plan to build your PLN in some other way. In class: we will discuss the set up of your ePort. Click here for instructions for PlymouthCreate. Click here for Reclaim Hosting to purchase a site for $30 (PSU students only: use this link for a small discount: https://portal.reclaimhosting.com/aff.php?aff=123). Click here to create free (with ads) at WordPress.com. If you already have a fully operational website, see me for permission to forego the new domain. If you prefer NOT to work on the open web, see me and we will make other arrangements to keep you in Moodle. In class: we will discuss the Interview assignment. In class: we will assign groups for discussions. 2/5/18 Bring a laptop to class every time we meet! Email a professor and get an interview meeting set up for this week (the week of the 5th)! Read Watters: “The Web We Need to Give Students.” Annotate with H.
Read Campbell: “A Personal Cyberinfrastructure.” Annotate with H.
Read Rikard: “Do I Own My Domain if You Grade It?” Annotate with H.
Make sure you have an ePort up and running! Play around with it until you like what you see! If you prefer not to write publicly on the web, shoot me an email with your rationale, and we will set up a space for you on Moodle. Remember that you can work under a pseudonym online if you prefer. Edit your ABOUT Page on your ePort. Add an image! Make sure your Twitter handle, Hypothes.is username, and ePort URL are on our log. Write an ePort post (not a PAGE! a POST!) in which you discuss the three readings for today. In your post, explore how these articles work together to set a scaffold for your IDS education. What do you like about these readings? How do they make you think differently about how you will learn and how you will work this semester? Use quotes from each article to add specificity to your thoughts. Log the URL for this post (not your ePort and not your wp-admin editing page, but the post itself!) on our log. In class: we will talk about the Interview assignment, the IDS program requirements, the IDS contract, the workshop sign-off sheet, the advisor meetings, and adding openly licensed images and links to your posts. Using some other process to slowly and deliberately build an acaprof community from which you can learn on a near-daily basis and TO WHICH YOU CAN CONTRIBUTE every week. Anything is fine, but come confer with me. Interview a professor in a field that you expect might be part of your major. Focus on their interdisciplinary work/interests, current challenges in the field, and what courses their students should take outside of their main field of study. Take an image to use for your post. Your interview post is not due yet. You just need to complete the actual interview by today. a QRCO (can’t be the same as your Math Foundations course). Find the Contract Form at our website. Send out your advisor emails to secure appointments and cc Robin on the emails. You will need two advisors; note that Robin MAY NOT serve as a formal advisor. Ask for help IMMEDIATELY if you need assistance choosing advisors. Make sure your ePort has: an About page, a Creative Commons or copyright license, a Twitter widget (if you are using Twitter for your PLN), social media sharing buttons, a menu, a functional blog, and no formatting glitches. Your ePort will be evaluated for these things on 2/19/18 at 4pm. In class: we will activate Akismet to control spam on your ePort. Interviews due to ePorts (make sure to add a new POST, not a new PAGE). You can see examples of great interview posts in our textbook in the chapter called “Academics on Interdisciplinarity: Professors Talk with Students.” Here are some tips. Post the link to our log (make sure you log the link to the POST, not to your general ePort, and make sure that “wp-admin” is not in the URL, since that is your editing page, not the link to the actual post). Posts due by 4pm. Bring hard copies of your completed contract, Planning Guide, and Essay to class (see below for more info). We will be workshopping these documents. REMINDER: Your ePort will be evaluated according to the checklist on 2/19/18 beginning at 4pm. Read Ristuccia: “Standing Alone” and annotate with H.
On your Planning Guide, you do not need to fill out semesters that you have already taken or are currently taking. 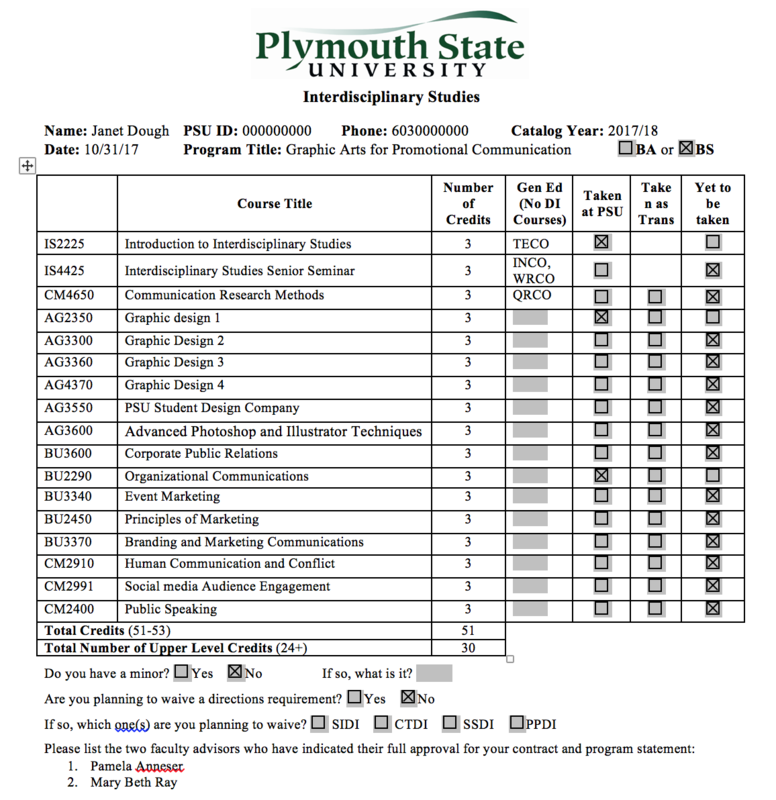 You only need to fill out semesters that you have yet to take. You don’t need to choose specific Gen Ed courses (you can just write in SSDI or WECO). 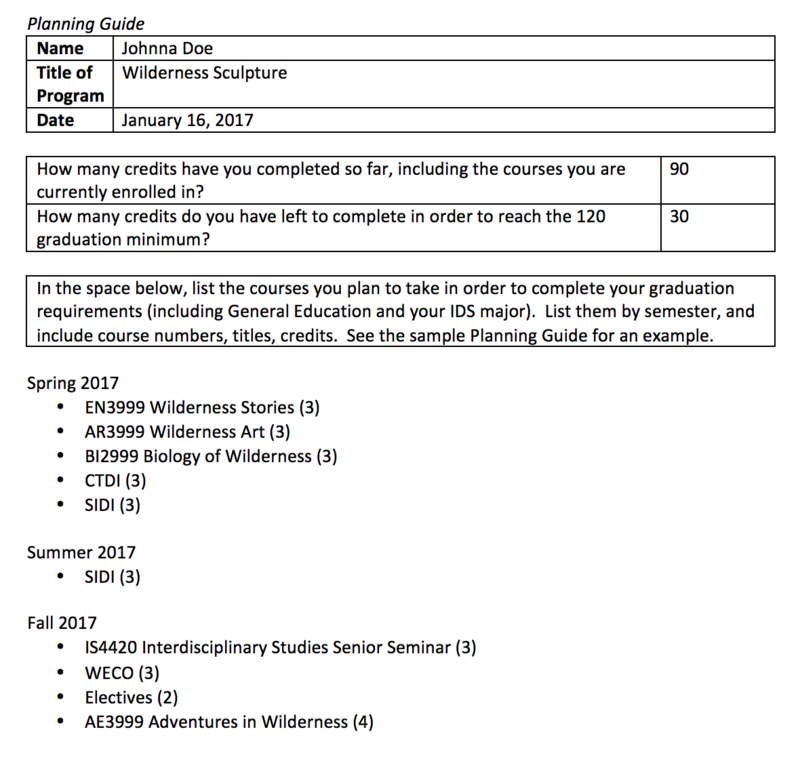 If you have electives to take (remember, you need at least 120 credits to graduate) you can just write in “Electives” (you don’t have to pick specific courses to take right now). Stop by our office or Open Hours for help! Remember that your advisors must tell you that they COMPLETELY APPROVE both your contract AND your essay. Make sure they have reviewed both and agree to all of it before you write their names in and submit. If you submit without their full approval, you could find yourself in violation of the PSU Academic Integrity policy, so please be sure! They will be contacted by IDS to confirm their approval. If you are applying for a WAIVER of one of the Directions requirements, fill out a Student Request Form. Please meet with Robin or Janina before completing it. Waivers are most commonly given for SIDI (for students whose majors include mostly science courses) and for CTDI (for students whose majors include mostly art courses). Remember to stop by the IDS office if you need assistance! Post a copy of your IDS program statement to your ePort (make sure it’s a POST and not a PAGE!). Log the link on our spreadsheet. Make sure you dress up your essay with images (your own or cc-licensed images). Tweet a link to your essay to our hashtag (#IDSintro) when it’s posted! Read Gregorian: “Colleges Must Reconstruct the Unity of Knowledge”. Annotate with H.
Read “The Big Terms.” Annotate with H.
Read Nissani: “Fruit: A Metaphor for Understanding Interdisciplinarity” Annotate with H.
Read “Concepts for DOING Interdisciplinarity.” Annotate with H.
Read “Content, Methods, Epistemologies.” Annotate with H.
Be prepared for a quiz on these five readings. You will be required to get all of the quiz questions correct in order to pass this course. If you don’t get 100% today, you can take a different version of the quiz as many times as you need at the end of class each Monday, until you get 100%. Read Nissani: “Ten Cheers for Interdisciplinarity.” Annotate with H.
Post: Explain what you think most attracted you to interdisciplinary approaches to learning. How do you think interdisciplinarity has or will improve your education and your future? What are your experiences with interdisciplinary learning (courses, projects, experiences, etc) so far, and how have they shaped your ideas about the world’s knowledge? Be sure to quote from Gregorian and Nissani in your post, and use terms and concepts from our readings so far. Don’t forget to post the link on our log by 4pm! Read “The History of the Academy and the Disciplines” and annotate with H.
Read “Where We Begin” and annotate with H.
Read “Disciplines as Social Communities” and annotate with H.
Read “The Benefits and Challenges of Interdisciplinarity” and annotate with H.
Read “How Do We DO Interdisciplinarity?” and annotate with H.
Read “Concrete Challenges of Doing Interdisciplinary Work” and annotate with H.
ePort Post: Describe an interdisciplinary success story. Choose something (a product, initiative, phenomenon, organization, outreach effort, movement, etc) that benefits from the input of people across two or more disciplines and/or which benefits from transdisciplinary partnerships between experts in the university and stakeholders outside the university. Describe the story, the disciplines and stakeholders involved, and why it is a good model for us to consider as we imagine our programs and our futures. Your story could be related to your own interests and field, or something completely different, whichever you prefer. Check out this example if you need help getting started. Add relevant hotlinks to news stories or further reading, and don’t forget to add an image (your own or openly licensed!). Read “Why Openness in Education” and annotate with H.
Read “Open Pedagogy” and annotate with H.
Read “What an Open Pedagogy Class Taught Me About Myself” and annotate with H.
Read “Excerpts from Connected Learning: A Context for Interdisciplinarity” and annotate with H.
Read one of the Student PLN posts in the “Open Pedagogy and Connected Learning” section of our textbook (your choice which one) and annotate with H.
Select a full-text scholarly article on Interdisciplinary Studies, interdisciplinary teaching and learning, or interdisciplinary education. Start by checking the library databases, and if you need help identifying a SCHOLARLY article, visit the Reference Desk in Lamson. The article must be at least four pages long and it must be published from 2012-Present. Write an ePort post summarizing your article and explaining why it is helpful to your thinking. Engage with the ideas, quoting passages that you analyze in further detail. Explain how the article’s main points interact with your experience as a beginning interdisciplinarian. Make sure you cite your article properly, and attend to the blog tips as you craft your post. Make sure you add images (your own or cc-licensed) to your post, and log the link on our spreadsheet by 9pm tonight. The office is open 6-9pm if you need assistance! ePort post: write a post that focuses on two things you have learned about this semester in two different courses (neither IS2225 nor IS4425). Summarize your learning, and explore why you found these ideas interesting, citing sources such as articles, professors, and textbooks as you go. Add a final reflection about how these ideas connect to each other, fuel your major, and excite you to continue your learning. Split up the posts in your group’s two columns. Have each person read some of the posts and choose their two favorites. Then share those favorites with each other and choose the TWO BEST POSTS from each column. Make sure everyone agrees on the four total posts you select. For each of the four chosen posts, write a short introduction (minimum of 80 words, maximum of 175). The intro should explain the assignment (you can look back at the syllabus if that helps), and then explain what is so great about the selected post. It should end with a discussion question. Post your intro with a link to the post on today’s GoogleDoc, and be sure to list your name on the intro that you wrote. PLN Portfolio Due by 9pm: This must include a one-paragraph introduction (What is a PLN? Who/what is part of your PLN? How did you build your PLN? ); a 1-2 paragraph discussion of open pedagogy and connected learning (use quotes and concepts from the reading for 4/9); a one-paragraph conclusion (how does your PLN affect your education? major? future? etc. ); and documented evidence of the interactions with your network. To document interactions with your network if you used Twitter to build your PLN, I would suggest creating a Twitter “Moment” and then embedding that into your post. A Moment is just a collection of your tweets that you can pick and choose from. Choose the ones you like (or all of them!) and add them to your Moment, then publish your Moment, copy the embed code, and paste it into your post to add the Moment to your post (remember to use the “text” screen when working with code!). Step by step directions made by my friend Alan are here. ALL OUTSTANDING GREENLIGHT ASSIGNMENTS DUE by 9pm. NO WIGGLE ROOM. What did you think this course would be like? What did you think the definition of “interdisciplinarity” was before taking this course? 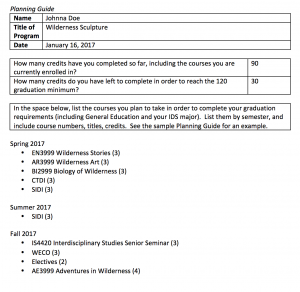 How did your understanding of IDS change over the course of the semester, and how would you define it now? Why does interdisciplinarity matter to universities? Why does it matter to the world? What are your hopes for your future? What are your hopes for the future of IDS, at PSU and beyond? Add hyperlinks and images to your post to increase its appeal and impact. Please plan to attend the End-of-Semester Celebration on Tuesday, May 15th from 5-7:30pm in Frost House.